Courage and Character: The Buffalo Soldier & the Red Tail: Generals Benjamin O. Davis and Benjamin O. Davis Jr.
American History would not be the same without the life, work and prophetic ministry of Dr. Martin Luther King Jr. Dr. King was born in a time when most of the country was segregated when “separate by equal” was simply façade to cover the lie that in no way did African Americans have equal rights or privileges in the United States. Dr King was born less than 60 years after the secession of the Southern states from the Union and the beginning of the American Civil War. Though that blood conflict had freed the slaves it had not freed African Americans from prejudice, violence and discrimination. When Dr. King began his ministry and was thrust upon the national stage as the strongest voice for equal rights and protections for blacks the discrimination and violence directed towards blacks was a very real and present reality in much of the United States. However there were cracks beginning to appear in the great wall of segregation in the years preceding Dr. King’s ascent to leadership as the moral voice of the country in the matter of racial equality. In baseball Jackie Robinson became the first African American player in Major League Baseball opening a door for others who would become legends of the game as well as help white America begin its slow acceptance of blacks in sports and the workplace. Likewise the contributions of a father and son Brigadier General Benjamin O. Davis Sr. and General Benjamin O. Davis Jr. were advancing the cause of blacks in the military which eventually led to the desegregation of the military in 1948. The impact of these two men cannot be underestimated for they were trailblazers who by their lives, professionalism and character blazed a trail for African Americans in the military as well as society. Benjamin O. Davis Sr. was a student at Howard University when the USS Maine exploded and sank in Havana Harbor. He volunteered for service and was commissioned as a temporary 1st Lieutenant in the 8th United States Volunteer Infantry. He was mustered out of service in 1899 but enlisted as a private in the 9th United States Cavalry one of the original Buffalo Soldiers regiments. He enlisted as the unit clerk of I troop of 3rd Squadron and was promoted to be the squadron Sergeant Major. Davis was commissioned while the unit was deployed to the Philippines and assigned to the 10th Cavalry. He was assigned in various positions throughout his career including command, staff and instruction duties including as Professor of Military Science and Tactics in various ROTC programs. He reached the rank of rank of temporary Lieutenant Colonel and Squadron Commander of 3rd and later 1st Squadron 9th Cavalry from 1917-1920 in the Philippines before reverting to the rank of Captain on his return as part of the post World War I reduction in force. Davis continued to serve during the inter-war years and assumed command of the 369th Infantry Regiment New York National Guard in 1938. 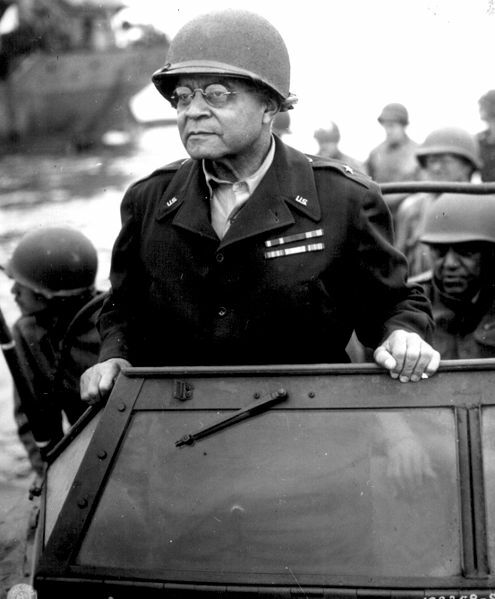 He was promoted to Brigadier General on 25 October 1940 becoming the first African American elevated to that rank in the United States Army and was assigned as Commander 4th Brigade 2nd Cavalry Division. He later served in various staff positions at the War Department and in France and was instrumental in the integration of the U.S. Military. He retired after 50 years service in 1948 in a public ceremony with President Harry S. Truman presiding. He was a member of the American Battle Monuments Commission from 1953-1961 and died in 1970. 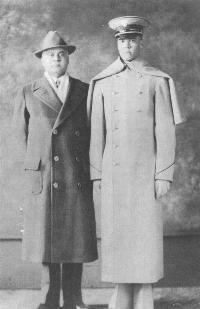 Colonel Davis with his son Cadet Benjamin O Davis Jr. He was denied entrance to the Army Air Corps because of his race and assigned to the Infantry first to the all lack 24th Infantry Regiment at Ft Benning where he was not allowed in the Officers Club due to his race. Upon his commissioning the Regular Army had just 2 African American Line Officers, 2nd Lieutenant Davis and his father Colonel Davis. After completion of Infantry School he was assigned as an instructor of Military Science and Tactics and the Tuskegee Institute. In 1941 the Roosevelt Administration moved to create a black flying unit and Captain Davis was assigned to the first black class at the Tuskegee Army Air Field and in March 1942 one his wings as one of the first 5 African Americans to complete flight training. In July 1942 he was assigned as Commanding Officer of the 99th Pursuit Squadron which served in North Africa and Sicily flying Curtiss P-40 Warhawks. He was recalled to the United States in September 1943 to command the 332ndFighter Group. However some senior officers attempted to prevent other black squadrons from serving in combat alleging that the 99th had performed poorly in combat. Davis defended his squadron and General George Marshall ordered an inquiry which showed that the 99th was comparable to white squadrons in combat and during a 2 day period over the Anzio beachhead the pilots of the 99thshot down 12 German aircraft. Davis took the 332nd to Italy where they transitioned to P-47 Thunderbolts and in July 1944 to the P-51 Mustang which were marked with a signature red tail. 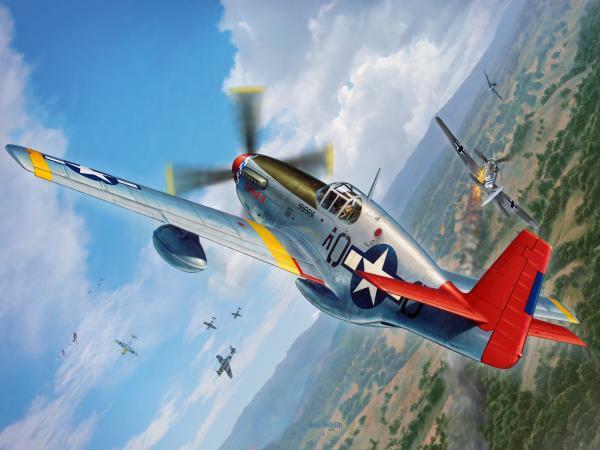 During the war, the units commanded by Davis flew more than 15,000 sorties, shot down 111 enemy planes, and destroyed or damaged 273 on the ground at a cost of 66 of their own planes. Their record against the Luftwaffe was outstanding and their protection of the bombers that they escorted was superb with very few bombers lost while escorted by them men that the Luftwaffe nicknamed the Schwarze Vogelmenschen and the Allies the Red-Tailed Angels or simply the Redtails. 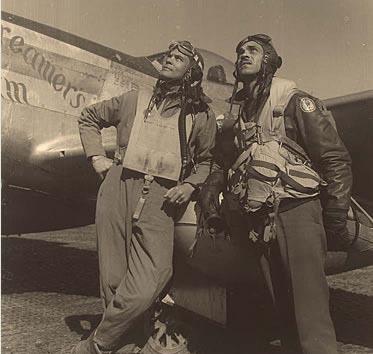 Davis led his Tuskegee Airmen to glory in the war and their performance in combat helped break the color barrier in the U.S. Military which was ended in 1948 when President Truman signed an executive order to end the segregation of the military. 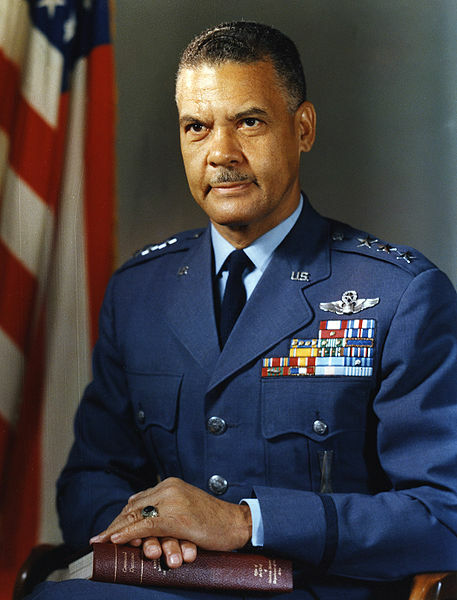 Colonel Davis helped draft the Air Force plan and the Air Force was the first of the services to fully desegregate. Colonel Davis transitioned to jets and let the 51st Fighter Interceptor Wing against Chinese Communist MIGs in the Korean War. He was promoted to Brigadier General in 1954 and served in numerous command and staff positions. He retired in 1970 with the rank of Lieutenant General and was advanced to General while retired by President Clinton in 1998. He died in 2002 at the age of 89.